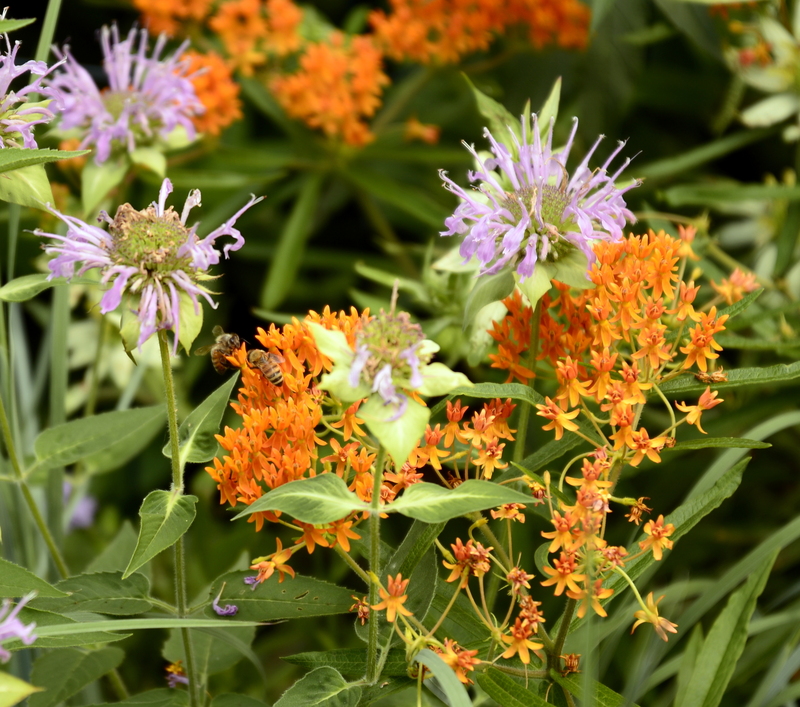 A butterfly garden can be as small as three square feet or as big as a thousand acres, as long as it’s a pesticide-free planting of native perennials and grasses on a sunny site. You can tell that native plants are going mainstream when CBS News does a story about monarch butterflies and habitat loss. Mark Bittman is always interesting, whether he’s giving us recipes or informing us about the intersection of food and the environment. Most recently he showed that Round-Up (glyphosphate), the “harmless” and “short-acting” herbicide that’s widely used in commercial agriculture and home gardens, is most likely a carcinogen. A glimmer of hope for monarchs? The orange-and-black butterflies are suffering from loss of milkweed habitat in the United States, illegal logging in Mexico and climate change. The rosy-pink flowers of red or swamp milkweed, the tallest of the natives. Common milkweed. Image copyright UMass Extension. Orange butterflyweed, the lowest growing of our native milkweeds, prefers a dry, sunny site. The lead story in today’s Science Times concerns a new threat to monarchs: too much love. It seems that people in northern areas are planting milkweed for monarchs, which is great, but some are planting tropical milkweed species instead of our native temperate zone species. Finding milkweed at the wrong time of year, the monarchs breed out of season, leading to reproductive failure and high rates of disease. Nature is complicated. 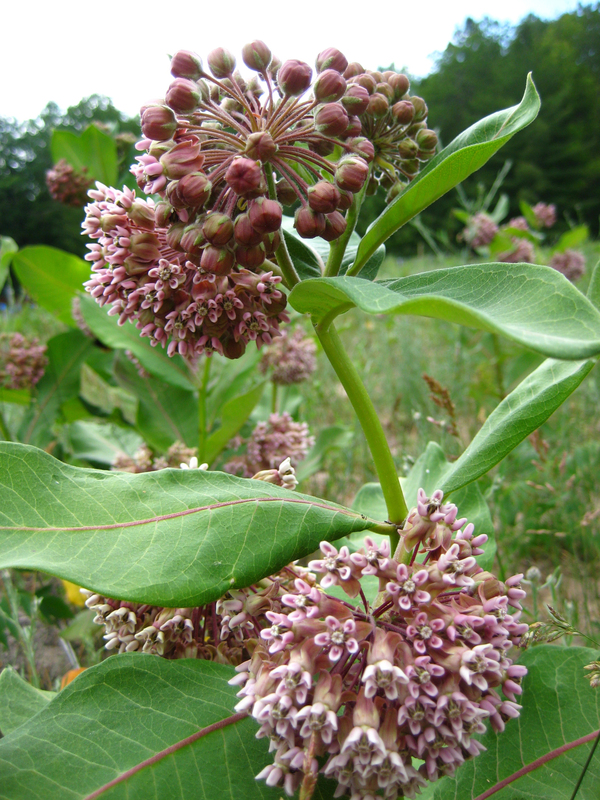 or common milkweed (A. syriaca), which has large, leathery leaves and can still be found growing wild in our area. That quote can be found in today’s LA Times in an article about a petition from over 100 scientists to the leaders of the United States, Canada, and Mexico. The petitions asks the three heads of state to include discussions about ways to save the monarch in their upcoming NAFTA summit. Specifically, it suggests that both the United States and Canada better manage roadsides to protect and preserve native plants. Mexico is attempting to stop illegal logging in the forests the monarchs use for their winter roosts, but up north, along the migration route, more and more milkweed is disappearing all the time, especially now that farmers are growing corn that’s genetically modified to resist herbicides. 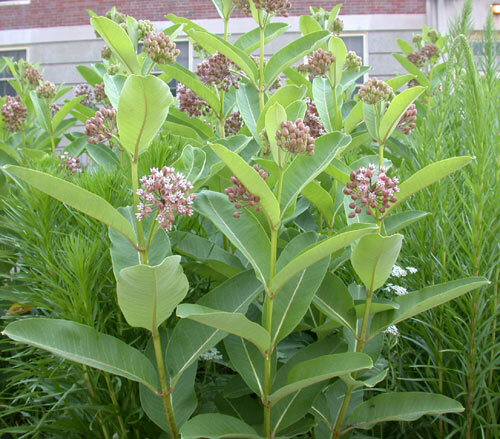 This allows for increased use of herbicides, with the resulting destruction of the wildflowers, including the milkweed plants the monarchs need for their caterpillars. 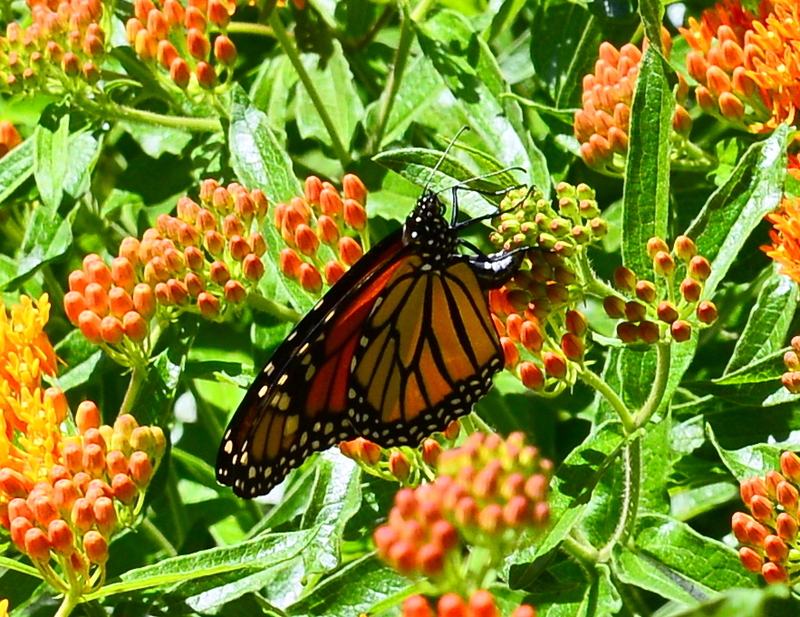 (For a description of the monarch’s life cycle and an explanation of its reliance on milkweed, see this blog post. Read more about the monarch in previous posts on this blog and on the website of the World Wildlife Fund and Monarch Watch. WWF has also written an open letter to the three leaders, asking them to address this issue at their upcoming summit. And of course, you might consider emailing the White House about the issue. But do it quickly–the NAFTA summit is next week. 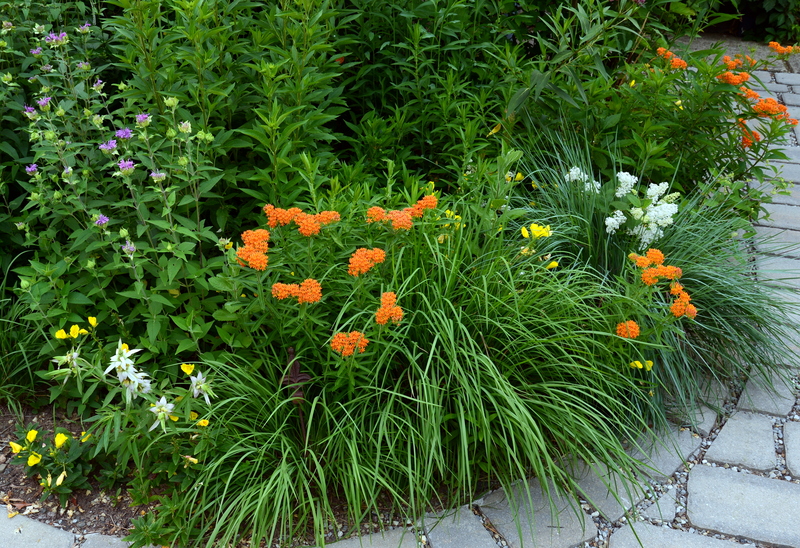 And of course, you can plant some lovely, carefree milkweed, like this orange butterfly weed (Asclepias tuberosa) in a sunny spot yourself. If you do, you’re almost sure to see monarchs in future summers. If they don’t go extinct. Today’s NY Times Sunday Review section carried an eye-opening article about the migration of monarch butterflies–or rather, the fact that the migration has almost collapsed. See also this previous post about the details of the migration to understand why it really is a problem if pesticides and genetically modified crops result in the disappearance of milkweed. 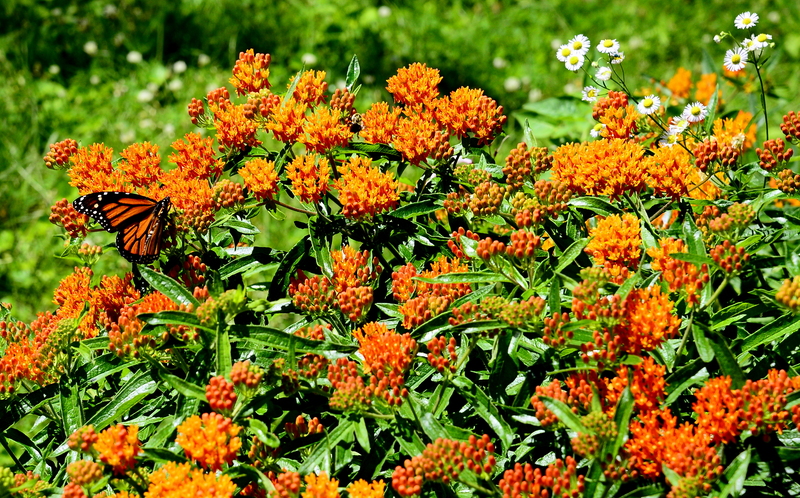 Add milkweed to the list of plants you plan to order next spring. 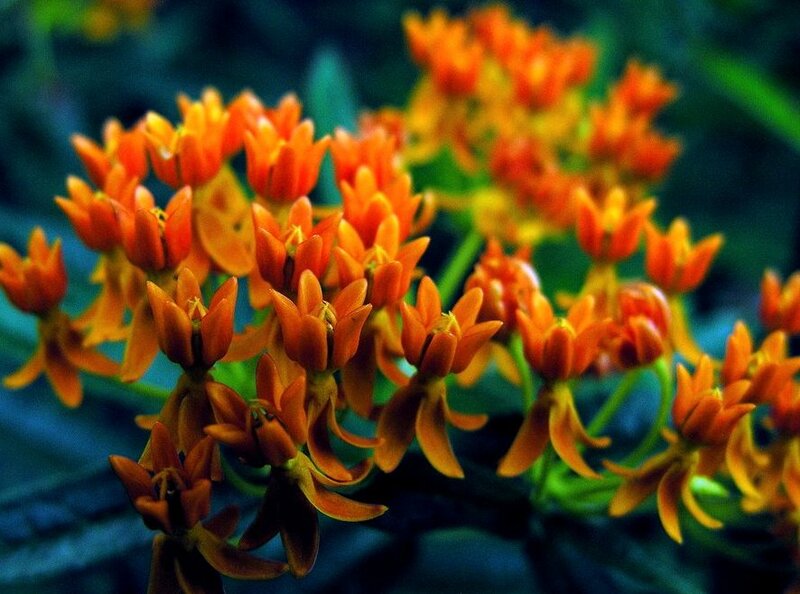 The picture above shows a closeup of the flowers of orange butterflyweed, Asclepias tuberosa. It’s a drought-tolerant species that needs full sun, grows 2-3 feet tall, and blooms in June and July. And, of course, attracts butterflies by the score. 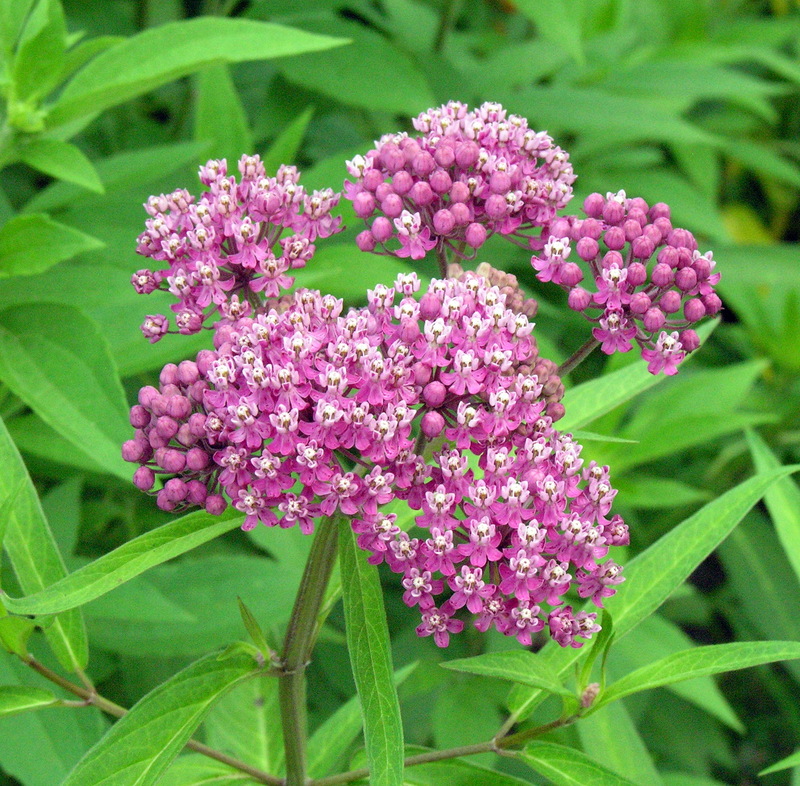 Another lovely and easy-to-grow species is swamp or red milkweed, Asclepias incarnata. 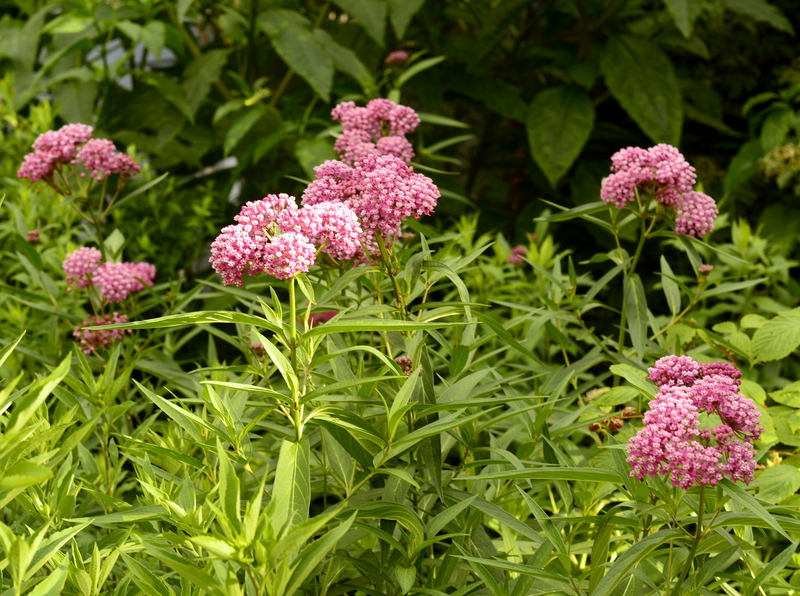 It likes moist soil (although it does just fine in my dry, sandy soil) and full sun, grows up to 4 feet tall, and produces lovely pink flowers, also in early summer. Pink or orange–take your pick. In a previous post, I described two lovely species of milkweed (Asclepias) that I grow and explained the relationship between milkweed and monarch butterflies. But the ecology of milkweed is much more complicated than the simple equation of milkweed = monarchs. 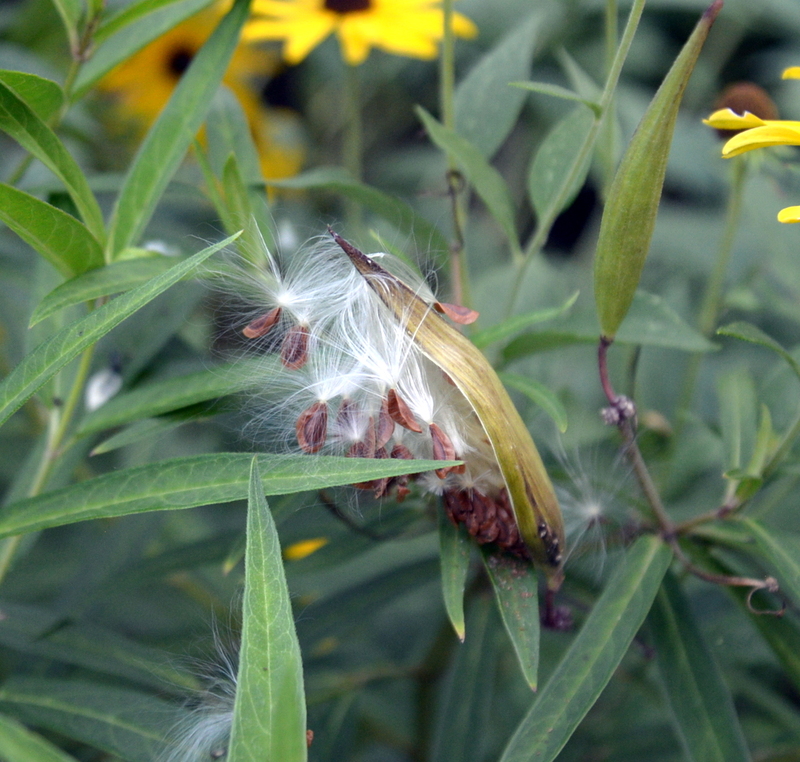 Lots of other critters are dependent on milkweed as well. 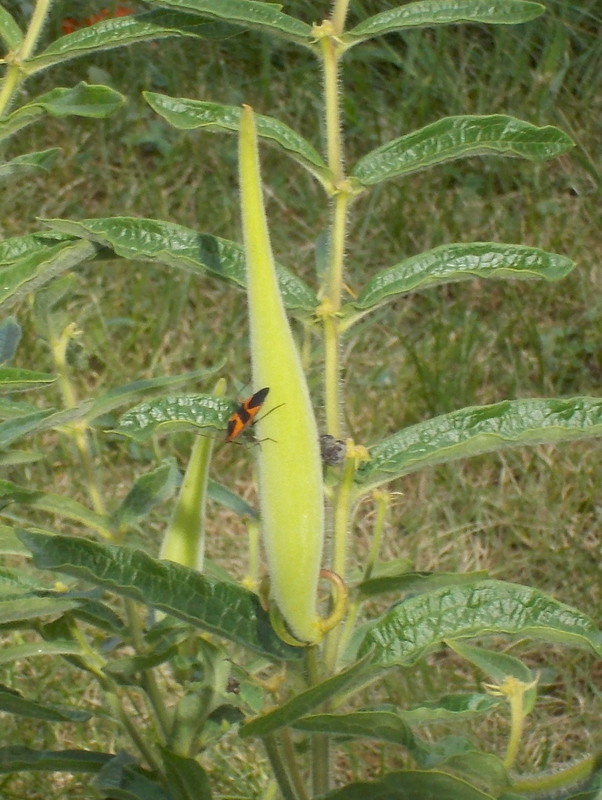 There are milkweed bugs, milkweed beetles, and milkweed aphids, to name just a few, and all feed on milkweed and nothing but milkweed. All these critters can safely consume the cardiac glycosides in all parts of the milkweed plant. All have bright orange coloration so that their predators are warned away. I’ve seen very few monarchs this season. Usually many arrive to lay eggs on the milkweed leave in July; this year I saw only one. Loss of wintering habitat in Mexico may be the problem. So may a dramatic increase in pesticide use. As you see, there’s a low level of infestation this year. Some years all the pods on all the plants are completely covered with bugs. The seeds inside the pods never develop. But then guess what happens? The plants hold some pods in a kind of suspended state–the pods remain tiny. As soon as the bugs complete their life cycle and die off, the plants then grow and develop those seed pods. Pretty amazing, isn’t it? It happened just last year, when the infestation was particularly bad. I think my plants are enjoying a low point in the milkweed bug population cycle this year–generally a population will reach a high point, crash, and the gradually recover. The seeds leave the pod one by one, slowly and gracefully drifting away. This undoubtedly increases the probability that they will land away from the parent plant. Plants have all kinds of strategies for spreading their seeds, but this is one of the loveliest I know.